Striking white-on-black stitching and a zipper are not all that make Takesyo jikatabi stand out from other brands. They also incorporate several stretchy vinyl patches to the back and sides. This ensures a really good fit to just about anyone. Striking white-on-black stitching and a zipper are not all that make Takesyo jikatabi stand out from other brands. 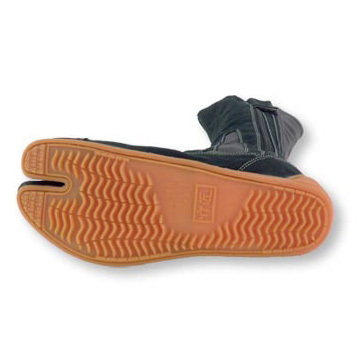 They have the usual soft natural rubber soles and heavy duty canvas upper, but to allow the shoe to adjust to different foot and leg shapes they also incorporate several stretchy vinyl patches to the back and sides. This ensures a really good fit to just about anyone. Average rating of 4.5 from 4 customers. Decent as primary shoe, Great for light use. well, though the wear and tear is certainly noticeable. I suspect I will get another 3-4 months out of it, maybe more.rnrnThe design is rather handsome, and the shoe itself holds together very well. The zipper is by far the best feature when comparing with other tabi. Putting them on and off takes no time at all and I have never had a problem with them getting loose or coming undone, even with rigorous practice.rnStay out of puddles or wet grass! Anything that makes it higher than the rubber sole will get sucked up by the cloth of the shoe. Par for the course with most jika Tabi on the market. rnrnUnfortunately, my pair have a sort of 'buldge' on the inside ankles, which has two negative effects. First, it ruins the aesthetic of the shoe (which if we are honest is one of the reasons to wear Tabi, they look cool!) The second, and on a practical level, is that the bulge leaves room for my heels to slide inward. This leaves me occasionally walking halfway on the sole, halfway on the extra fabric. rnI assume this is a manufacturer error, as I have not seen this stated in the other reviews, and so my rating is based on a pair that do not have these bulges.rnrnAll in all, a competitive product. Great for light use, outside martial art practice or maintained forest trails.rnAs an everyday shoe? I manage but I suspect I will be needing a new pair in the future. rnI would recommend these, especially if you are new to the Tabi market. 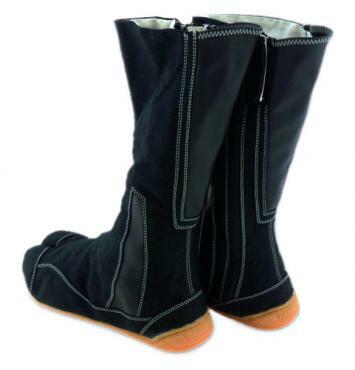 I bought these along with the Marugo Matsuri Jog 12's and they have been great pieces of foot wear so far. Fairly comfortable, very nice fit. The style is appealing to look at, but aside from that, there's not much to say bad about them. feels thick, rough and of good quality, so I'd say you get value for your money. They are also conformable and fit good even if you have a little chubbier calves or ankles thanks to the elastic fake leather -like material at the back and sides ensuring a snug fit. The main reason for practibility, however, is the zipper on the side which makes putting these on and taking them off a breeze without having to make a hazzle with kohaze like in traditional jika-tabi, and the zipper too is well built without it resorting to opening itself after a while or anything, the shoe also has a velcro strap in the side to keep the zipper protected. 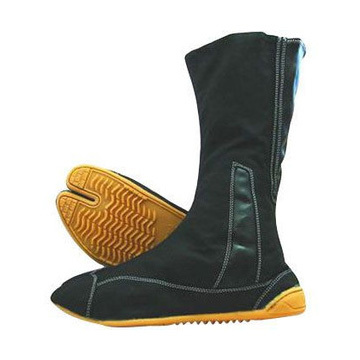 My only main concern is for the soft rubber sole, I'd imagine it wears out pretty fast if one would use these on rought materials like asphalt a lot and you can't replace the sole either, but I'm sure these are fine for some light outdoor use and mainly for indoors.rnrnThe only downside on these is that you basically need to have tabi insoles, which are not exactly common unless you live in Japan, but with scissors one can make impromptu insoles that fit these from normal ones, and wear socks with these as they are not that good with bare feet only, which might mean your feet might get a bit hot during the warmer summer months if moving actively for long periods of time. The sizing also isn't exactly proper, my shoe size is normally 42EU, so naturally I ordered the 27JP/9US size, but turns out the size is actually 42.5EU making these a bit loose for my feet, but like I said before it's mendable by using insoles and socks.rnrnAll in all, I'm happy with my first tabi boots and got exactly what I wished for.